The cold weather in Ft. Drum, home of the Army’s 10 Mountain Division (Light Infantry), is a perfect environment to train soldiers for operations in Iraq and Afghanistan. Located in upstate New York just 30 miles from Canada, Ft. Drum regularly withstands lake effect snows and extremes in temperature. Two manned flight simulators for the CH47F Chinook Helicopter on site at the base required enhanced protection against these harsh winter conditions. Shelter Structures created a single 120’ long weather-tight portable shelter that could be split into two 60’ buildings. The structure was engineered to hold up to 70 lbs. per square foot of snow (the standard is 20 lbs. per square foot), and is heavily insulated with an interior liner. Read the Case Study. 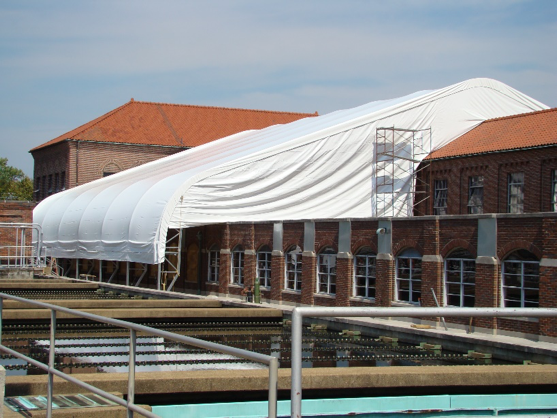 Petty Construction needed to cover an historic water plant while repairing the roof. Working with the client, we designed this asymmetrical building (the legs on the other side of the building are longer) that could be moved as the work progressed. 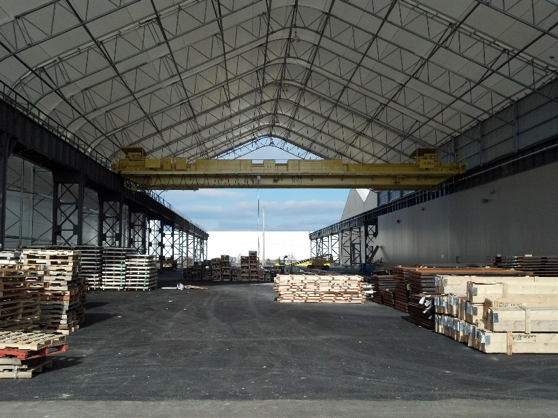 It allowed Petty to complete the project and protect the shelter as well CAF Industries in Elmira, NY, needed to cover a bridge crane that was attached to a building built I 1906. We brought our engineer along to examine the structure to see if it could support our building. We determined it could, and “hung” one side of our shelter off the existing building. CAF Industries in Elmira, NY, needed to cover a bridge crane that was attached to a building built I 1906. We brought our engineer along to examine the structure to see if it could support our building. We determined it could, and “hung” one side of our shelter off the existing building. Innovative solutions. That’s what we do. Read more about the project. Whatever your unique situation, we can figure which of our fabric shelters suits your needs. Contact Shelter Structures to discuss your requirements. 23’W x 25’L x 17’H. Totally enclosed shelter used to store chemical components.